Yesterday I got the news that every caretaker dreads: My dogs’ food is on a recall list. Natura has issued a voluntary recall of some of their Innova, Evo, California Natural and Healthwise products. The products on the recall list include food for dogs, cats, and ferrets. I was afraid, and could not rest until I’d checked the list of potentially contaminated products to see if I had any in my home. But I was still worried. What do I do? Do I keep feeding my dogs this same brand, or do I try something else? Unless I am willing to go it like Celi at The Kitchen’s Garden, I’m going to have to trust somebody to provide me with food for my animals. Who am I going to trust? Two things about Natura impressed me yesterday. First of all, they chose to issue the voluntary recall. If you live in the US like me, you know that doesn’t always happen so quickly. And second, I received an email last night from Tammy Barker of the company, letting me know about the recall. I can’t tell any of you what to do. But I’ve decided that what’s right for me is to trust that if Natura did the right thing this time, they will keep doing so in the future. For now, I’m sticking with them. I do encourage you to regularly check recall lists. I am fortunate to have some wonderful Facebook friends who regularly post recalls. The FDA list of recalls is here. Another good online resource is Dog Food Advisor. Have you found yourself in a similar situation before? What did you choose to do? I got worried too when I saw that Waggin Train was voluntarily recalled by nestle-purina. It’s been my dogs’ favorite treat for at least 4 years. I give them each a half piece every 2 days and we’ve no problems so far. They’re more than halfway through one large pack now. I wonder if I’ll be overly cautious if I stop giving it to them right away. I don’t know as much about that recall, but I have heard lots of folks complaining about the product long before the recall was issued. We’ve never had a recall of dog or cat food here. I imagine it must be quite scary. It is scary! I wonder why you don’t have them there? It’s not necessarily a good thing. I mean it doesn’t necessarily mean, that our food is better, after all some of the brands are the same. Fortunately by now we had good luck with my food. Thanks for the links Rumpy. That would give you a scare I imagine, even though it’s voluntary. thank you for sharing the links.. i’m glad my pets’ dog food is not included.. Thanks again pal for keeping us informed and for passing that link along. M said she’s going to make an effort to check that link herself frequently. Like you, we would probably trust Nutro also because they issued the recall themselves before they were forced to. I feel the same way. I am feeding Innova and I was especially worried because Brooks was not feeling well. But I was impressed with the way Natura handled the situation. I called the phone number to check if my bags were okay, and not only was my call answered after only a short wait, but also the person on the phone was genuinely concerned and helpful. Then I also got an email from Tammy Barker at 10pm, and I know they are all concerned and want to get accurate information out there. So I am continuing to feed Innova and I feel they have earned my trust. Hmmm…we haven’t had any those experiences for our food…..but if we had, we wouldn’t buy any of products from the same company for a while…….. I love that Dog Food Advisor will email alerts. Another thing to do is to sign up for email alerts from the company too. Honestly, I don’t know what I’d do if my dogs’ food got recalled. Scary. I think it’s important that they voluntarily recalled it. Unlike the tainted chicken from China and the companies that blatantly refused the recall. Nutra is showing good faith. For us, with our allergies to grains, and still struggling with grain free dry foods. We opted to feed a raw diet. We have more control what is fed to our pack and if it is grain fed or not. It’s very scary when this happened! It happened to us once and I read some horrible complaints about the dog food on http://www.consumeraffairs.com that made me switch Simba’s food. I think it is good that Nutra voluntarily recalled it. I don’t remember that happening with the dog food that Simba used to be on. Thanks for sharing the links, not sure how I would find out about a recall otherwise. Hopefully I’ll never need them, but it’s nice to be prepared. Such a scary situation. You always worry. Thanks for the link. Thanks for the links. I need to check. Sounds like Natura is a good company, with a savvy PR department which understands its customer. I’m sure it helps that they have a good product. I have HEARD… but do not know for a fact… that if you order food or treats from Chewy.com… THEY will notify you if there is a recall. It is really scary … when a recall goes out. Having two dogs, it’s always so scary. I’ve had to deal with recalls, and my experience (with 2 different companies) has varied from being notified, to hearing about it well after people were complaining–and they finally pulled the product. Take care, Rumpy! We are all currently eating one of the California Natural grain free products, so Mom freaked when she heard earlier today about the recall. Ours is not on the list, but it still does make Mom a little worried. We will stay on it for now since we all seem to be doing OK with it. Changing food with four dogs isn’t always easy and Mom loves it when we can all eat the same one. All paws crossed things stay OK for us and you. Back in 2007 when there was the massive recall of many pet foods because of melamine found in the food, some of the foods that we ate were involved. Our mom spent time talking to the various manufacturers and researching foods. At that point, our mom decided that she wouldn’t feed us anything with grains because that seemed to be the big issue. It seems like no company is immuned to problems. But it’s how they handle them which is telling. It sounds like Natura did the right thing here. Food recalls are so scary, there should be heavy fines involved if food is contaminated. You think you are doing something good for your pets by buying expensive food and it could kill them. We feel really sorry for the people who have lost animals due to this problem. We buy Halo’s Spot’s Stew. The kitties love it and it is doesn’t have fillers or grains. Food recalls are scary. I’ve never heard any from our local brands which I guess isn’t such a bad thing but I do hope that our local companies will issue a recall when there is a need to do so. Hey Rumpy! Want a cookie? It’s good to know. I am so glad mom gives me Halo. Hi Rumpy, we just read about you from Clowie’s blog and would like to say HI to you. Thanks for sharing the links. We are glad that our food is okay! Phew! Those recalls are really scary. 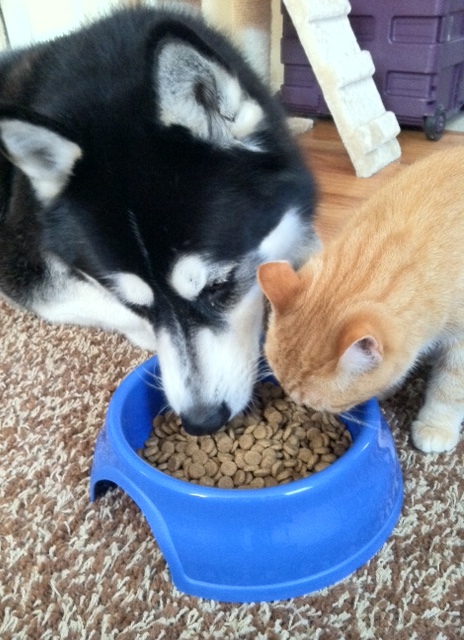 Pet Food Recall info and great links for FDA recall and Dog Food Advisor. Thank you Rumpy Dog for posting this. We’re all grateful for all you do to spread the word to help us help our fury family. Thank goodness my kitty’s brand isn’t on the list. I’m in Canada and haven’t heard anything about ANY recall. I can imagine how terrifying this might be. Thanks for the heads up. Wes so furry happy that what we’s eats is not on any list. Mommy makes most of the hairy slobbery sister’s foods and is furry picky about the crunchies wes is allowed to eats. The stuff of nightmares! For my humans at least. That is impressive of them! I had already switched from them, not because I don’t love their food but because my poor 16 year old can’t chew it anymore. The Honest Kitchen issued a voluntary recall of some of their formulas about a month ago. Luckily, Taylor’s formula was not part of the recall. I decided to stick with The Honest Kitchen because I was thoroughly impressed by the good business ethics they uphold, which resulted in the voluntary recall. also we can make great factors with a reduced budget. -NO SOMOS PERSONAS DISADVANTAGE EQUIPOS, SOMOS UN EQUIPO DE PERSONAS PARA SERVIRLE!